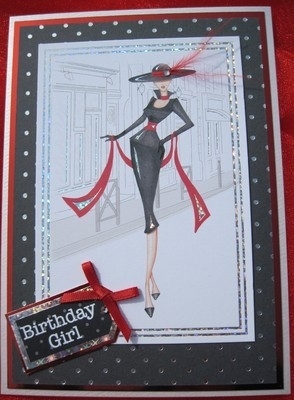 A stylish lady in a black dress, with a broad-brimmed hat, with holographic highlights mounted on a black and silver polkadot background, which is mounted onto red mirror card, all on a white shantung effect card 126 x 178mm (5" x 7"). 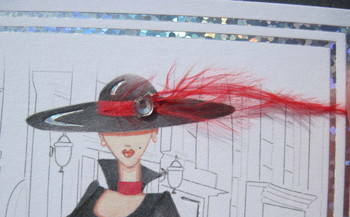 The tag 'Birthday Girl' is attached with a red bow, and there are red feathers attached to the hat with a crystal gem. The paper insert reads 'Wishing You a very Happy Birthday' or pick an alternative below. The front can be further personalised with an 'age' number at no extra cost. 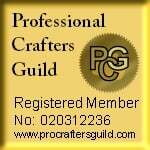 Please use the personalisation form below.